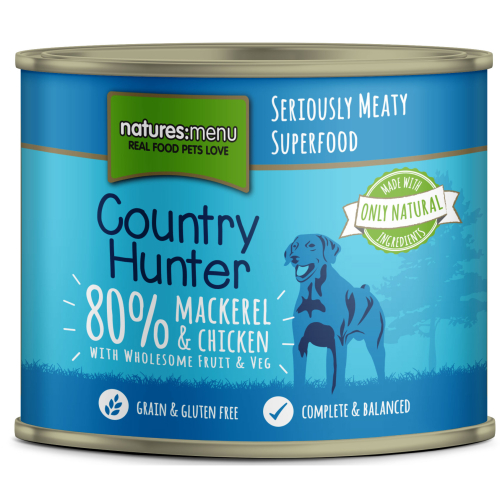 Natures Menu Country Hunter Mackerel & Chicken is a delicious dual protein meal of flavoursome mackerel and succulent cuts of chicken with red berries, pumpkin seeds and autumnal vegetables. Completely balanced and steam cooked to lock in all the goodness, providing your dog with all the vitamins and nutrients he needs. It contains 80% human grade meat with 20% fruit and vegetables, grain and gluten free and no meat meals, derivatives, artificial colours or flavourings. Protein 11.2%; Crude Oils & Fats 5%; Crude Ash 2.3%; Crude Fibres 0.5%; Moisture 78%.